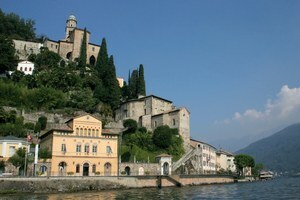 Lugano is an international city and the crossroads and melting pot of European culture. It is not only the Ticino's most important city, and Switzerland's third most important financial center (after Zurich and Geneva), but also a town of parks and flowers, villas and sacred buildings, and it has been a holiday destination for many Swiss since the end of the 1800's. With its Mediterranean flair, Lugano offers all the advantages of a world-class city, combined with the cachet of a small town, and in addition, a beautiful lake and uncountable hills and mountains surrounding the area. Lugano is located in Southern Switzerland, in the Italian speaking Canton of Ticino; it is situated at an elevation of 273 m (896 ft) above sea level on the northern shores of Lake Lugano where the river Cassarate enters the lake between the Monte Brè and the Monte San Salvatore. Lugano has its own airport with some international flights and with daily connections to Zurich-Kloten and Geneva-Cointrin. The Lugano-Agno airport is easily reached within 20 minutes from Lugano by car, taxi or shuttle bus. Zurich-Kloten is the closest Swiss international airport (approx. 3 hours by train; 2.5 hours by car); and visitors to Lugano might want to consider flying to/from the Milano-Malpensa airport in Italy, which is less than 90 minutes away by car (approx. 2.5 hours by train). There's also a shuttle bus Lugano - Malpensa with several deprtures daily. The Lugano railway station, which is on the international north-south axis of the St. Gotthard (Milan-Chiasso-Zurich), offers fast and easy connections to all major destinations in Switzerland and neighboring countries. Travelers to/from Lucerne want to consider the scenic train William Tell Express which also includes a scenic steamboat ride on Lake Lucerne. Travelers to/from Graubunden (Chur, Davos, St. Moritz) enjoy the scenic train (and bus) Bernina Express via Tirano, Italy, and the Bernina Pass to St. Moritz, Davos and Chur; or the scenic bus-ride on the Palm Express via Chiavenna, Italy and the Maloja Pass to St. Moritz.